All states and territories have submitted their final tallies of names for babies born in 2017 and one thing is clear - the nation's new parents are favouring tried and tested monikers for their sons and daughters. Figures revealed for the first time today show the top boys' and girls' names across Australia for the past four to five years are still our favourites. 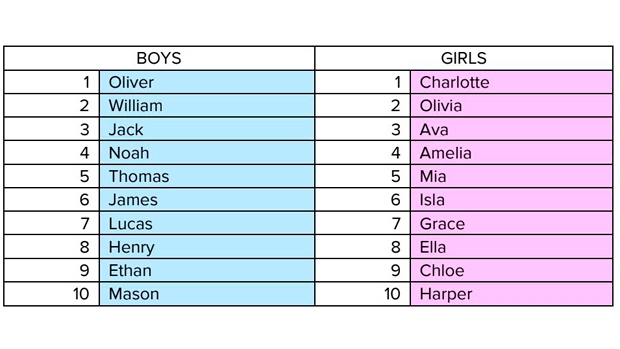 Social researchers at McCrindle have yet again done all the hard work, crunching the numbers to name Charlotte the top girl name of 2017 - her third year in a row - and Oliver the top boy name, for the fourth year running. It's a big welcome to Mason and Harper, both complete newcomers to the national top 10. Mason sat just outside at number 11 last year, so he has been a rising star for a while. Harper ranked 15 in the 2016 results. Other than those two, it's business as usual, with the top six names for boys all in the same positions as last year. 2016's hero Henry climbed another two spots to rank 8. Lachlan dipped out after maintaining a top 10 position for six of the last 8 years. It's also the first time Emily has missed out on a top 10 spot this decade. McCrindle reports that there are seven new boys' and five new girls' names in the top 100. Arthur came in at 83, Bodhi at 93, Jude 94, Asher at 97, Leon at 100 and Aaron at 98, though we suspect Aaron has seen this territory before. We've got Ivy at 18, Lily 19, Willow at 20, Violet at 37, Poppy 43, Jasmine 51, Rose 69, Daisy at 72 and Olive at 100th position. Australians like to name their baby girls using softer sounds, with 17 of the top 20 names ending in a vowel or a 'y.' Harper, Evelyn and Willow are the exceptions. Beginning in a vowel for girls, are 10 of the top 20 names. We love the next generation of royals, who have invigorated a family once seen as outmoded and too ultraconservative. While they've smashed some rules out of the stadium, they stick with traditional names, and we love them too. The celebrities we know and love have a big effect on how Australian's name their babies. Names that were once off the radar, are suddenly on the tip of people's tongues when used by a much-liked celebrity, acquiring fresh glamour and cachet.